The recognition of positive rights and the growing impact of human rights principles has recently orchestrated a number of reforms in mental health law, bringing increasing entitlement to an array of health services. In this book, Penelope Weller considers the relationship between human rights and mental health law, and the changing attitudes which have led to the recognition of a right to demand treatment internationally. Weller discusses the ability of those with mental health problems to use advance directives to make a choice about what treatment they receive in the future, should they still be unable to decide for themselves. 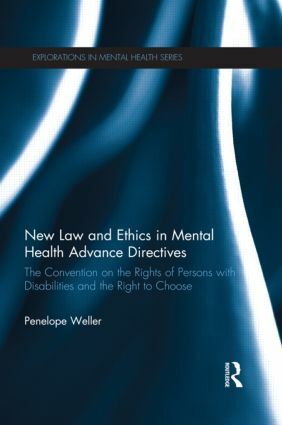 Focusing on new perspectives offered by the Conventions on the Rights of Persons with Disabilities (CRPD), Weller explores mental health law from a variety of international perspectives including: Canada, Australia, New Zealand and the United Kingdom, where policies differ depending on whether you are in England and Wales, or Scotland. These case studies indicate how human rights perspectives are shifting mental health law from a constricted focus upon treatment refusal, towards a recognition of positive rights. the right to demand treatment. The text will appeal to legal and mental health professionals as well as academics studying mental health law, and policy makers. Introduction: The Right to Choose. Part I: The Convention on the Rights of Persons with Disabilities. A Quiet Revolution. The Social Model of Disability. Non-discrimination and Informed Consent. Part II: Mental Health Advance Directives. The Genesis of a Movement. Ontario, Canada and the Principle of Choice. Mental Health Advance Directives in England and Wales. Advance 'Statements' in Scotland. Policy Development in Australia and New Zealand. Part III: The Right to Choose. Access to Treatment. Best Interests and Choice. Consensus, Recovery and Potential. Conclusion: Beyond Consensus. Penelope Weller is the Deputy Director of the Centre for the Advance of Law and Mental Health at Monash University, Australia.